These programs actively involve teachers, adult volunteers, and students in investigating the diverse habitats and wildlife at the refuge. The hands-on, small-group activities are designed to teach basic ecological concepts and to introduce endangered species, migratory birds, and wetland habitats to the students. All programs have been correlated to the appropriate State of California Education Standards. We are piloting new and modified activities that support Next Generation Science Standards. Educators and adult leaders conduct their own field trips after attending a Field Trip Training or Workshop. The Trainings and Workshops allow you to design and conduct your own field trip. In addition, adult volunteers must be recruited to lead the activities at the different learning stations and to chaperone the rotation groups of students. We provide easy to follow "scripts" for each station, but both "leaders" and "chaperones" are strongly encouraged to attend a Field Trip Workshop. New teachers must attend a Field Trip Workshop. Location of activities and trail conditions may vary. Please call for accessibility information. The field trip is designed for grades K-6, for up to 65 students. 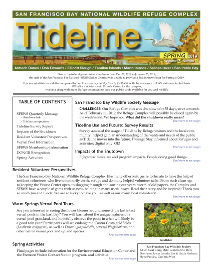 Field trip dates and registration information are posted on the refuge’s website http://www.fws.gov/refuge/Don_Edwards_San_Francisco_Bay/Field_trip_Progr... and in the issues of Tideline magazine. Field trip dates and registration information are posted on the refuge’s website http://www.fws.gov/refuge/Don_Edwards_San_Francisco_Bay/Field_trip_Progr... and in the issues of Tideline magazine. New teachers who have not yet attended a field trip workshop must attend the training. We highly recommend that returning Teachers accompany Parent Leaders and Chaperones to a workshop prior to a field trip. The workshop dates will be announced on-line with the Field Trip Registration information (see above). Guided Field Trips are offered at the Environmental Education Center in Alviso. Programs generally last from 1 ½ hour – 2 hours. Reservations must be made at least eight weeks in advance of the desired field trip date. Contact Hope Presley at 408-262-5513 ext. 104 or at hope [ . ] presley [ @ ] sfbws [ . ] com to make a reservation. College instructor-led Tours are also allowed at the Environmental Education Center in Alviso. All college instructors planning this type of field trip must make a reservation at least eight weeks in advance of the desired field trip date. If your group size is over 25 you will need to acquire a Special Use Permit from our Headquarters office in Fremont. Please contact Genie Moore at 408-262-5513 ext. 100 or at Genie_moore@fws.gov, or Hope Presley at 408-262-5513 ext. 104 or hope [ . ] presley [ @ ] sfbws [ . ] com. The Living Wetlands Program provides a first-hand learning environment for students and educators to explore the topics of watershed health, wetlands, and habitat preservation. Activities and presentations focus on the relationship between personal habits and their effects on local wetlands. Living Wetlands is an environmental education program offered at no cost through the cooperative efforts of the City of San Jose, U.S. Fish and Wildlife Service, and the San Francisco Bay Wildlife Society. Due to funding restrictions, first priority will be given to schools in the following districts: Alum Rock Union Elementary, East Side Union High, Franklin-McKinley Elementary and San Jose Unified. Second priority will be given to schools in San Jose, Milpitas, Santa Clara, Saratoga, Monte Sereno, Los Gatos, Campbell, and Cupertino. This program incorporates multiple activities related to wetlands and watershed health. Participating classes will receive one pre-classroom presentation from Living Wetlands educators, a field trip to the Don Edwards Refuge, and one post-classroom presentation. All include hands-on activities and demonstrations. There is a limitation to 60 students per field trip, and a 1:10 chaperone to student ratio is required. Presentations include an in-depth look at the habitats of the south bay along with the pathways of indoor and outdoor water use. Students will have a better understanding of the role they play in the health of their watershed and what personal actions they can take to help. The presentation takes approximately one hour. Please contact us for specific classroom presentation needs. For more information, or to make a reservation, call Colter Cook, the Living Wetlands Program Coordinator at 408-262-5513 ext 102 or email at colter [ . ] cook [ @ ] sfbws [ . ] com. The Blue Goose School Bus Field Trip Transportation Fund was started with funding from the U.S. Fish and Wildlife Service’s Connecting People with Nature Program. The San Francisco Bay Wildlife Society has provided additional funding for the current school year. The program will be administered by the U.S. Fish and Wildlife Service and San Francisco Bay Wildlife Society Staff. The fund was created to help Title 1 schools access the Wetland Round-Up and Living Wetlands Field Trip Programs at the Don Edwards San Francisco Bay National Wildlife Refuge Environmental Education Center in Alviso and the Newark Slough Learning Center in Fremont. Please refer to the USFWS website for more information: https://www.fws.gov/refuge/don_edwards_san_francisco_bay/for_educators/b.... You may also contact Genie Moore at 408-262-5513 ext. 100 or email genie_moore@fws.gov . The Don Edwards San Francisco Bay National Wildlife Refuge offers free, hands-on programs for youths. During the programs participants learn about endangered species, migratory birds, wetland habitats, and the relationship between personal habits and their effects on the San Francisco Bay. These programs are designed to meet badge/ patch requirements of Scout Groups, but anyone can participate. Because of the popularity of such programs, reservations are required. Children under the age of 16 must be accompanied by an adult. Badges are not provided. Below are the names, dates, and descriptions of the programs. Programs at the Environmental Education Center are sponsored by the Santa Clara Valley Urban Runoff Pollution Prevention Program and the San Francisco Bay Wildlife Society. The Environmental Education Center offers the youth programs which are listed below. Please email Hope Presley to make a reservation and customize your visit at hope [ . ] presley [ @ ] sfbws [ . ] com. Note: Ratio of 1 adult per 5 children maximum. Space is limited to 20 people, including siblings. The Webelos and Arrow of Light Adventures present “Into the Wild.” Similar to the previous naturalist badge we will learn about birds, migration, flyways, food chains, human impact, and the importance of wetlands. Then take a walk and use our binoculars to spot birds in the wild. Journeys: WOW! Watching our Water: Life can’t exist without water, neither can rainbows! Water does so much for you. Can you return the favor? On this journey you will take action by discovering how to love water, save water, and share water. Household Elf: make a natural cleaner, water log on ways to save water, trash clean up, discover natural filters. Hiker: go over trail map, leave no trace, detective hike with birds. Journeys: Get Moving! : Are you prepared to use your energy to save the planet? On this Journey, you’ll find out how to reduce your energy use, make buildings energy efficient, and create a plan to fix an energy problem in your community. Badges (from Get Moving badge activity set): Gardner: outdoor garden, native plant garden design, seasonal plants, seeds and soil, plant own native plant to take home. Badges (from aMUSE badge activity set): Animal Habitats: puppet show, explore five different habitats, make bird house, learn about endangered wetlands and animals, help clean up. The Refuge Headquarters offer Webelos programs for up to 15 Webelos. To register, call 510-792-0222 ext. 362 or at https://donedwardswebelos.eventbrite.com. Program is led by June Smith.